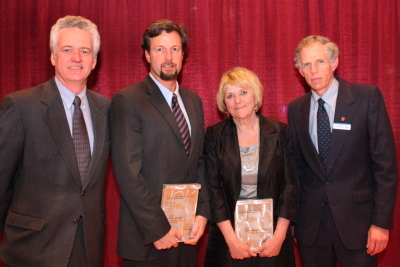 A Simon Fraser University professor who is an international expert in environmental policy and a University of Victoria professor working on preventing injuries amongst senior citizens received the 2008 CUFA BC Distinguished Academics Awards on March 26th. SFU’s Mark Jaccard was named the 2008 Academic of the Year for his tireless work in persuading governments to enact effective policies to deal with climate change. UVic’s Elaine Gallagher received the 2008 Career Achievement Award for employing her studies of injuries sustained by senior citizens to prevent falls through training of health professionals and changes in living environment. These awards are presented annually to recognize faculty members at BC public universities who use their research and scholarly work to make contributions to the wider community. “Prof. Jaccard and Prof. Gallagher are outstanding examples of public university faculty members who use their considerable research talents to improve our communities,” said Chris Petter, President of CUFA BC. Mark Forsythe, host of CBC Radio One’s BC Almanac, emceed the awards dinner on Wednesday, March 26th at the Law Courts Inn in Vancouver. The CUFA BC Distinguished Academics Awards are in their fourteenth year and receive generous support from the University of British Columbia, Simon Fraser University, the University of Victoria, the University of Northern British Columbia and Royal Roads University. While the environment, and global warming in particular, has become a major political concern in the past few years, this only came about because of the efforts of people like Simon Fraser University professor of Resources and Environmental Management, Mark Jaccard. For more than two decades, Jaccard has dedicated his academic work to developing sustainable energy systems. While others have taken on that challenge through scientific and technological means, Jaccard’s research and scholarly activity focuses on the role of government policies in helping or hindering us in achieving sustainable energy solutions. Jaccard’s measured, but unyielding, approach to his academic work is exemplified by the list of organizations and individuals he has worked with over the years: the Canadian Council of Chief Executive Officers, the Royal Society of Canada, the C.D. Howe Institute, David Suzuki, the Intergovernmental Panel on Climate Change, Michael Ignatieff and the China Council for International Cooperation on Environment and Development, amongst many others. Like any good academic, Jaccard challenges conventional wisdom and political fashions in his quest for knowledge. He raised eyebrows in the environmental movement with his Donner-Prize-winning book Sustainable Fossil Fuels: The Unusual Suspect in the Quest for Clean and Enduring Energy, and was heavily criticized by some business leaders as one of the architects of BC’s new carbon tax. When you are honored by the C.D. Howe Institute and lambasted in Capitalism Magazine, you know you’re getting people to think differently. His new book, Hot Air: Meeting Canada’s Climate Change, written in conjunction with Globe and Mail columnist Jeffrey Simpson and SFU researcher Nic Rivers, Jaccard analyzes decades of failures by governments, industrialists and environmentalists in reducing greenhouse gases. In the book, he proposes a few simple, yet effective, policies that will significantly reduce greenhouse gases over the next few decades, with minimal negative effects on the economy. For his no-nonsense analysis of environmental policy, for his work towards sustainable energy systems, and for his tireless efforts in Canada and internationally to engage policy makers and the public in an urgent discussion about our collective future, Dr. Mark Jaccard received the 2008 CUFA BC Academic of the Year Award. When Nursing is mentioned in the university context, most people’s minds will immediately turn up images of student nurses learning how to care for the sick and injured. Although this professional education remains the backbone of Nursing as an academic discipline, Nursing in the 21st century is a multifaceted enterprise. This is no better exemplified than by Elaine Marie Gallagher, a professor of Nursing at the University of Victoria and the Director of the University’s Centre on Aging. Gallagher started her career as one of those student nurses who learned her craft when nursing schools were largely based in hospitals, not universities. She worked as a nurse for a time, but it wasn’t long before she became a hospital-based nursing instructor herself. Her career path paralleled the changes in the profession. She became an instructor at Lakehead University, earned her Master’s degree in Nursing from Duke University, and was promoted to the professorial ranks at Lakehead. In 1980, she came to UVic as a nursing professor, earned her doctorate at SFU in 1988, and became a full professor at UVic in 1997. Gallagher’s move to UVic coincided with the beginning of her academic work on the challenges facing our senior citizens. Her particular focus, for which she is being honoured with this award, is on the prevention of falls amongst seniors. While a broken hip would be an inconvenience for many of us, 20 per cent of seniors who sustain a hip fracture die within a year of the injury and 90 per cent of hip fractures are due to falls. Gallagher took up the challenge of identifying risk factors for falling, and extended that research to develop a range of measures to prevent falling. These included obvious things, like getting cities to repair uneven sidewalks. They also included recommendations to doctors to do regular medical assessments of their older patients for falling risks, and to pharmacists to be on the lookout for drug interactions that could affect a senior’s sense of balance. Gallagher’s research is leading edge and in 2002 she was named as the top nurse researcher in Canada by the Canadian Association of Nurse Researchers. In 2007, her professional achievement was recognized with an Outstanding Alumni Award from SFU. For using her academic work to improve the health and safety of senior citizen’s and for advancing the progress of Nursing as an academic discipline, Dr. Elaine Marie Gallagher received the 2008 CUFA BC Career Achievement Award.